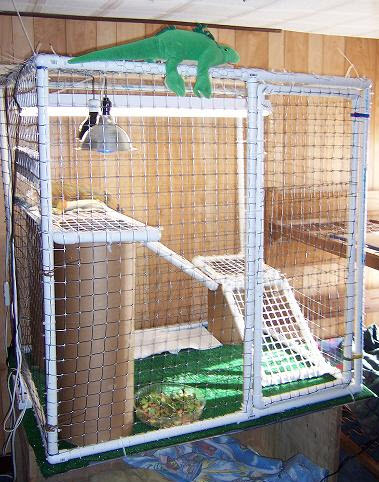 Build a square cage for your iguana using PVC pipe! Cut pieces of pipe to the lengths needed for each section of the frame, then assemble the pipes with PVC connectors. Cover each section of the frame with wire mesh, and attach the door on the frame with gate hinges. Cut a piece of plywood to the size needed for the base of the cage, then cover the wood with Astroturf. Drill holes along the edges of the platform, then use zip ties to attach the PVC cage on the platform. Make shelves inside the cage using PVC, cover the shelves with plastic mesh, and attach them in place with zip ties. Cut cardboard cylinders to the lengths needed, and set them under each of the shelves for added support.